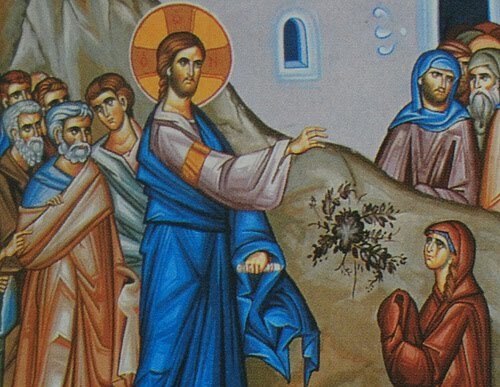 The collect and readings for the Ninth Sunday after Pentecost, Proper 9A, may be found here. The appointed gospel is Match 15:21-28. Jesus left Gennesaret and went away to the district of Tyre and Sidon. Just then a Canaanite woman from that region came out and started shouting, “Have mercy on me, Lord, Son of David; my daughter is tormented by a demon.” But he did not answer her at all. And his disciples came and urged him, saying, “Send her away, for she keeps shouting after us.” He answered, “I was sent only to the lost sheep of the house of Israel.” But she came and knelt before him, saying, “Lord, help me.” He answered, “It is not fair to take the children’s food and throw it to the dogs.” She said, “Yes, Lord, yet even the dogs eat the crumbs that fall from their masters’ table.” Then Jesus answered her, “Woman, great is your faith! Let it be done for you as you wish.” And her daughter was healed instantly. Most of us know that song well. For many of us it describes the Jesus of our childhood, the Jesus of our growing up. It’s simple. It’s easy. It conjures up images of a sentimental faith and a sweet, cuddly Jesus. Those are images many still cling to. That’s how we want the world to be, the way we want to live, and who we want Jesus to be. The problem is that that kind of faith encourages a naiveté about God, life, and the world. Look at the pictures of the Somalian famine. Listen to our politicians. Calculate the cost of our wars. Study history. Walk amongst our guests at the food pantry. Talk with a cancer patient, their surviving spouse, or the alcoholic struggling to get well. Balance the family budget, work full time, raise your kids, be faithful in you marriage, and while you are at it remember to eat well and exercise. We all know what it’s like. We’ve each got our own story. We need a faith that can carry us through this life. Too often a sentimental faith becomes cynicism, causes us to turn away from our difficulties, or leaves us feeling paralyzed. Life is neither simple nor easy. So why should we settle for a faith that is? grown up? Yes, Jesus loves us but faith is not about sentimentality and Jesus is not always soft and cuddly. Just ask the Canaanite women in today’s gospel. She’ll tell you all about it. She’s not one of the chosen people. She’s an outsider that the insiders don’t want to be around. When we were kids we would say she’s got cooties. There’s just something about her that is not acceptable. On top of that she is a woman in a society in which woman have no real value or standing. To make matters worse she’s a screamer with a crazy kid. Life for her is neither simple nor easy. Sentimentality won’t cut it. She needs help so she comes to Jesus. Yes, Jesus loves her but he ignores her and then calls her a dog. So what we do with that? Many have tried to explain it away. They offer excuses trying to justify Jesus’ behavior. None are really convincing. Maybe Jesus was just tired and having a bad day. Or he was teaching his disciples something. Really? At the expense of this woman and her daughter? Others say Jesus was testing her faith; as if her life was not enough of a test. Maybe Jesus didn’t understand the full extent of his mission and ministry. I suspect all the many excuses only highlight how embarrassed we are by this text. Regardless of why Jesus did what he did we don’t like it. It makes us uncomfortable. That’s not the Jesus we want but that’s the Jesus we get in today’s gospel. And sometimes that’s the Jesus we get in life. There are days that we pray and get no answer. We come before God and offer all that we are and all that we have. We speak our words, express our feelings, make known our needs and nothing happens. We wait. We listen. God is silent. It’s like talking to the walls of our room. If you’ve ever felt that way then you know this Canaanite woman. “Have mercy on me, Lord, Son of David; my daughter is tormented by a demon.” But he did not answer her at all. Instead he talked about her to the disciples. She heard every word. “I was sent only to the lost sheep of the house of Israel,” Jesus tells them. For her, however, there are no words, no gestures, no acknowledgment, no explanation. Nothing at all. What do we do when that happens? Where do we go? Do give up? Get mad? Quit the church? Sometimes someone will come to me and ask, “Why? Why is God silent? Why am I ignored?” I wish I knew. I don’t have an answer. Even if I did I doubt it would be satisfactory. So I do the only thing I can do. I send them back. “Go pray,” I say. “Just show up. Regardless of what God does or does not do you show up. Even if its seems God does not.” That’s what the Canaanite woman did. Jesus was silent. She could have gone home, argued, or asked, “Why?” But she didn’t. Instead she came closer to Jesus, fell before him, and kept on worshipping him saying, “Lord, help me.” That doesn’t make sense but that’s what she does. This woman who was ignored and seemingly rejected by Jesus moves even closer, entering deeper into his silence, and begs like a dog. She continues to show up trusting that somehow it is enough to just be there before him. At some point he has to act. She doesn’t know when or what he will do. She only knows that she will be there when he does do something. This time he answers. “It is not fair to take the children’s food and throw it to the dogs.” He called her a dog, an animal. Those words sound so harsh, so mean, so wrong. They are. But maybe they are not about Jesus or the woman. Jesus is naming the reality of the world in which they both live. The reality is that there are children and there are dogs. We see it everyday. Some have while many do not. Some are in and others are out. For some life flourishes. Others struggle to make it another day. Children and dogs. They did not make it that way. It was like that before either one of them were born. It was that way before they met and it is still that way today. That doesn’t make it right and we should do all we can to change it. However, that is the world in which we must pray, the world in which we must live our faith, the world in which we must learn to show up. That’s the world in which Jesus and this Canaanite women meet. Life is neither simple nor easy and dogs don’t eat the children’s food in this world. The woman knows this. She even agrees with Jesus. “Yes, Lord, yet even the dogs eat the crumbs that fall from their masters’ table.” She has again found a way to show up and be present even when it seems everyone and everything is against her. This time Jesus speaks and acts. “Great is your faith,” he tells her. That very hour her daughter is healed. So what do we do with that? Some say she finally wore him down and Jesus relented to get her to be quiet and go away. That sounds more like what we do. Some say she was rewarded for her persistence. Maybe, but you and I both know of persistence that did not get rewarded. So what’s the difference? Others suggest Jesus realized he was wrong and changed his mind. Perhaps. I don’t know why Jesus acted the way he did. Maybe we don’t need to know. Maybe this story is not even about Jesus. It’s about us, our faith, and our world. Life is difficult. Deep abiding faith is a real struggle. The world is broken and divided into children and dogs. In the dog days of life all we can do is continue to show up and that’s enough. God may or may not do what we want. It doesn’t really matter. To not show up is to only deepen the divide. To turn away means that we won’t be there when God does act. We will miss it. We will miss the moment of healing, the words of forgiveness, the acts that transform. We will never know that Jesus really does love us. I have been following your blog the past three months. Thank you for presenting real faith–its profound beauty as well as its inexplicable desperation at times. When I was taught to read scripture as a young adult, I was taught to focus primarily on the words and actions of Jesus as the One I was supposed to emulate. But now, thanks to these midlife years, I look to those around Jesus, for I am most like them than Him. How did they respond to Him? How would I, in that same place? I love the Canaanite woman—for showing up, clinging, and begging. She reminds me there is holiness in doing the same. Thank you for writing from her viewpoint. Thank you, DsMom, for reading my blog and your kind words. I think you are right in that those around Jesus have much to teach us. The midlife years really do ask us to see in a different way. In some way that’s what happens in this text. Jesus sees a dog who becomes a woman of great faith. That’s a hard scripture for sure … may explain why our rector chose to preach on the OT lesson instead. As usual though you gave me something to think about, to hold on to. Thanks for your words of wisdom. Ellen, I am glad the sermon offered you something. It is a hard text that raises more questions than answers. Thanks Deborah. I hope you are well. Thanks for putting this post up! You really opened up this part of Scripture for me, in a very honest way. I just discovered your blog a week or so ago and it is wonderful! Thank you for taking the time to put it up, it is a real inspiration. Sermons like yours really bring Scripture alive! Ian, thanks for your comment and encouraging words. I am glad you found my blog and that that particular post was helpful. I think, amongst other things, that this passage targets erratic prayer. When we want something we pray fervently for it but as time passes and there’s no answer or acknowledgement from God we give up and assume He said no. We’re being trained on earth to be like Jesus and “pray about everything” always- to be like the woman who kept going to the judge. God says we may seek Him but that we will find Him when we seek Him with all our hearts. And this woman did. We may ask why certain situations affect us but maybe it’s God’s way of getting us to seek Him with all our hearts. Her problem was massive- her daughter was “severely” demon possessed and she was a Gentile. We often claim that we are humble, that we accept how lowly we are but if God used a metaphor that implied you were a dog amongst his true children would you still follow Him- if He ignored you? Or would your pride be hurt? Jesus said she had great faith and healed her daughter. It can’t be forgotten that she was called a woman of great faith AFTER all of this happened. Trials, sorrows and great pain bring us closer to Him- they give us great faith. The Bible says it best, “For the kind of sorrow God wants us to experience leads us away from sin and results in salvation”- 2 Corinthians 7. Anyone claiming that God doesn’t want pain for us on earth but a good, carefree life may need to read their Bible. God cares about growth more than comfort. Stephanie, thanks for your insights. You are right, there’s not much to suggest that this faith is a feel good, painless, always happy journey. A friend of mine often asks, “Do you know how I got to be so smart? Suffering. Nearly everything I have learned, I have learned through suffering.” I try to remember that. Showing up seems to be the key to life and to faithfulness. There are, however, times I really don’t want to show up and it takes all I have to come to the table. I suspect we’ve all been the Canaanite woman.